Heat gas or charcoal grill. Soak skewers in water 10 minutes; drain. In medium microwavable bowl, mix cheese, chiles and Sriracha sauce. Microwave uncovered on High 4 to 5 minutes, stirring once after 2 minutes, until cheese melts and mixture is smooth; keep warm. Meanwhile, in medium bowl, mix chicken, 2 tablespoons of the olive oil and the taco seasoning mix. 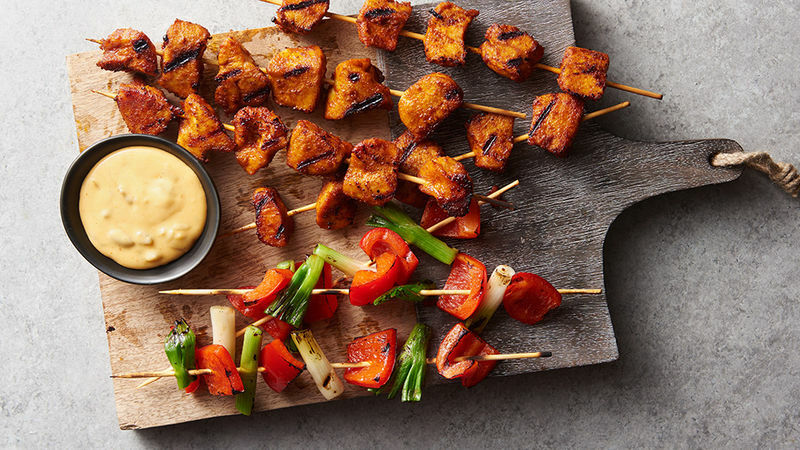 On each of 4 skewers, thread chicken, leaving 1/4-inch space between each piece. On remaining 4 skewers, thread alternating bell peppers and green onions. Brush vegetables generously on both sides with remaining 2 tablespoons olive oil; sprinkle with salt. Place kabobs on grill over medium heat. Cover grill; cook vegetables 6 to 8 minutes and chicken 10 to 14 minutes, turning kabobs 1 or 2 times, until grill marks form, vegetables are tender and chicken is no longer pink in center. Serve with cheese sauce. Craving carbs too? Stuff chicken and veggies into warmed soft tortillas, or serve over rice. If vegetables kabobs are finished before chicken kabobs, keep warm by covering tightly with foil or placing in a 200°F oven. Cheese sauce can also be kept warm, covered with foil, in the same oven.